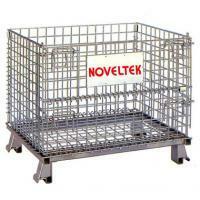 Simple type Warehouse cage(L800x W500 xH520 mm)WC-E2(WC-E2) - Noveltek Industrial Manufacturing Inc.
Unified specification, fixed capacity, storage at a glance, easy-to-stock, inventory, and a small amount of discharge of accessing a single layered material, to avoid rummaging through the trouble. Use of forklifts, lifts, cranes, can be stacked four high, resulting in three-dimensional effect of storage when not in use fold stacking, only 20% of the original volume. With forklifts, cranes, trolleys, lifts, hydraulic pallet truck or other transport equipment to use, since the raw materials entering the start, whether through the process several times to complete the product stored in the warehouse, and finally sent to the customer´s hands may apply application of this container, which can effectively reduce the damage during transportation and labor costs and save a lot of freight. The special design of the folding container, operation simple, safe, start folding and lightweight, space, application range, long life.